Search "SHIRTS" 342 results have been found. 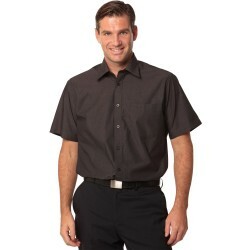 Mens Nano Tech Short Sleeve Shirt 60% Cotton, 40% Polyester Nano Silk Protein Finish. Regular Col- lar, Chest Pocket. Mens Nano Tech Long Sleeve Shirt 60% Cotton, 40% Polyester Nano Silk Protein Finish. Regular Col- lar, Chest Pocket. 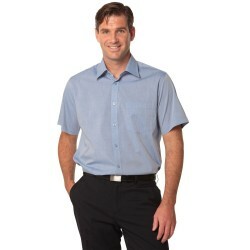 Mens Fine Chambray Short Sleeve Shirt 65% Polyester, 35% Cotton. Regular Collar, Chest Pocket. Mens Fine Chambray Long Sleeve Shirt 65% Polyester, 35% Cotton. 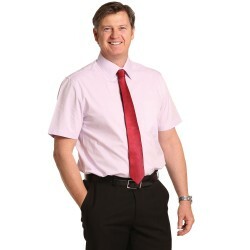 Regular Collar, Chest Pocket. 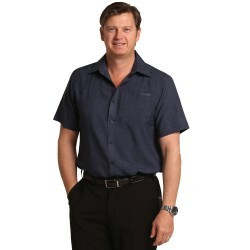 Mens Mini Herringbone Long Sleeve Shirt 60% Cotton, 40% Polyester. 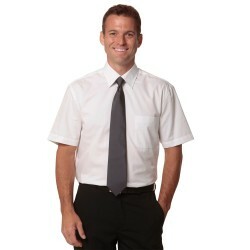 Regular Collar, Chest Pocket, Convertible Cuff. Mens Dobby Stripe Long Sleeve Shirt 100% Super Fine Cotton. Spread Collar, Chest Pocket. 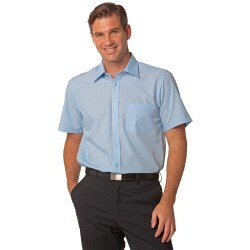 Mens Ticking Stripe Short Sleeve Shirt 74% Cotton, 22% Polyester, 4% Spandex. Classic collars, tailored fit. 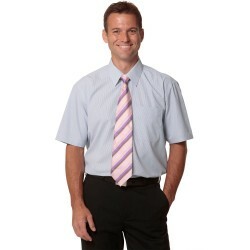 Mens Pin Stripe Short Sleeve Shirt 60% Cotton, 40% Polyester. Regular Collar, Action Back, Chest Pocket. 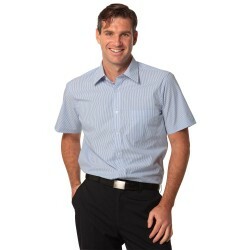 Mens Balance Stripe Short Sleeve Shirt 60% Cotton, 40% Polyester. Regular Collar, Chest Pocket. 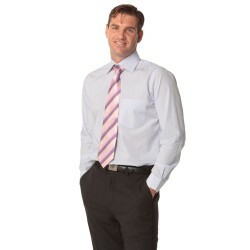 Mens Balance Stripe Long Sleeve Shirt 60% Cotton, 40% Polyester. Regular Collar, Chest Pocket. 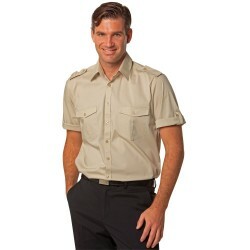 Mens Short Sleeve Military Shirt 60% Cotton, 35% Polyester, 5% Elastane, Silicone Washed. 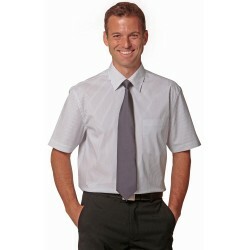 Roll-Up Sleeve, Chest Pockets, Removable Epaulettes. 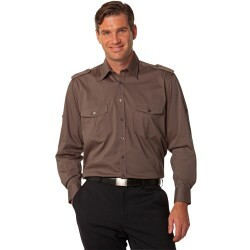 Mens Dot Contrast Long Sleeve Shirt 100% Premium Cotton. 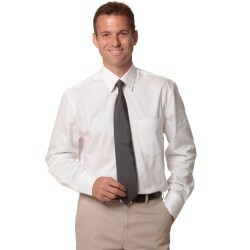 Button Down Collar, Chest Pocket. Womens Nano Tech Long Sleeve Shirt 60% Cotton, 40% Polyester Nano Silk Protein Finish. Regular Col- lar, Open Neck. Womens Nano Tech 3/4 Sleeve Shirt 60% Cotton, 40% Polyester Nano Silk Protein Finish. Regular Col- lar, Open Neck, 3/4 Sleeve with Roll-Up Feature. Fabric: 100% Cotton.Styling: Taylored Fit. Womens Fine Chambray 3/4 Sleeve Shirt 65% Polyester, 35% Cotton. Open Neck. Womens Mini Herringbone 3/4 Sleeve Shirt 60% Cotton, 40% Polyester. Regular Collar, Open Neck. Womens Stretch Tuck Front Shirt 60% Cotton, 35% Polyester, 5% Elastane. Tuck Front, Long Sleeve. Womens Fine Stripe Short Sleeve Shirt 60% Cotton, 40% Polyester. Regular Collar. Womens Fine Stripe Long Sleeve Shirt 60% Cotton, 40% Polyester. 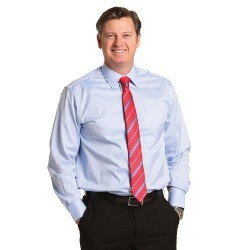 Regular Collar. Womens Fine Stripe 3/4 Sleeve Shirt 60% Cotton, 40% Polyester. Regular Collar. Womens Pin Stripe 3/4 Sleeve Shirt 60% Cotton, 40% Polyester. 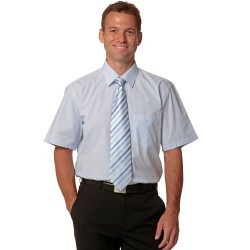 Regular Collar, Chest Pocket. Womens Pin Stripe Short Sleeve Shirt 60% Cotton, 40% Polyester. Regular Collar, Action Back, Chest Pocket. 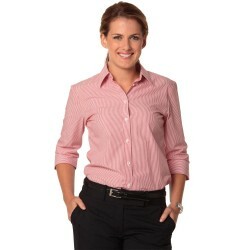 Womens Balance Stripe 3/4 Sleeve Shirt 60% Cotton, 40% Polyester. Regular Collar. Womens Balance Stripe Short Sleeve Shirt 60% Cotton, 40% Polyester. Regular Collar, Action Back, Chest Pocket.